Columbo gave me this book last year around the time I got married, which just shows you how big my to-read pile is that I only got around to this recently. It's a great book, lovely American-style paperback that flops open and feels smooth to the touch and is easy to read on the train. Oh, and what's in it is great as well. 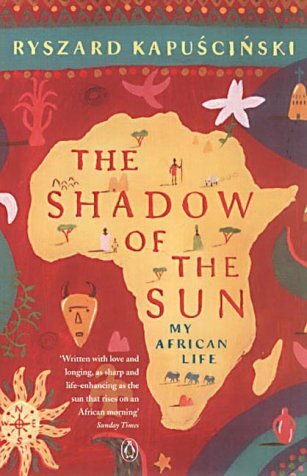 Ryszard Kapuscinski is a Polish journalist who wrote articles about his life in Africa from 1955 onwards, taking in the broad sweep of post-World War Two independence movements, dictatorships, famine, reconstruction and everyday African life. He acknowledges the difficulties inherent in attempting, as a white Northern European person, to get to the root of the nature of Africa, but he does a great job of sketching the basics. I like that he looks at geographical as well as political and historical factors, and that he never lets you forget some very basic facts, namely that Africa is very, very hot, and that it is very difficult to live there. I enjoyed this book immensely and will seek out more of the same. Welcome back! I have a load of Ryszard Kapuscinski books if you ever want to borrow them. Imperium, a journey around Russia after the fall of the Soviet Union, is particularly good.